An incident at a Madison Culver's restaurant in September has ignited debate over Wisconsin's open carry law for firearms. A 62-year-old woman visiting a local Culver's sees several restaurant patrons with guns on holsters in plain view. She doesn't know that Wisconsin law allows people to openly carry a firearm, so she notifies authorities, later telling them, "I didn't want to be that one person that saw guns and didn't call and something horrible happens." Officers arrive to find five armed men at the restaurant near East Towne Mall. In an effort to determine whether there is any threat to public safety, they ask to see the men's identification to make sure they're not felons, who are prohibited from possessing firearms. To some, the actions by Madison police Saturday evening are reasonable. But members of gun rights organizations say police had no reason to suspect the men were felons. And what happened next, they say, amounted to the illegal search and detention of two of the men when they refused to provide their IDs. Shawn M. Winrich, 33, of Madison, said he remained silent when police asked if he would provide his ID. Police then told him he was being placed under arrest, and he was handcuffed, disarmed, searched and held until police determined he was not a felon, Winrich said. Winrich and Frank R. Hannan-Rock, 53, of Racine, were then given municipal citations for obstructing an officer, Madison police spokesman Joel DeSpain said. 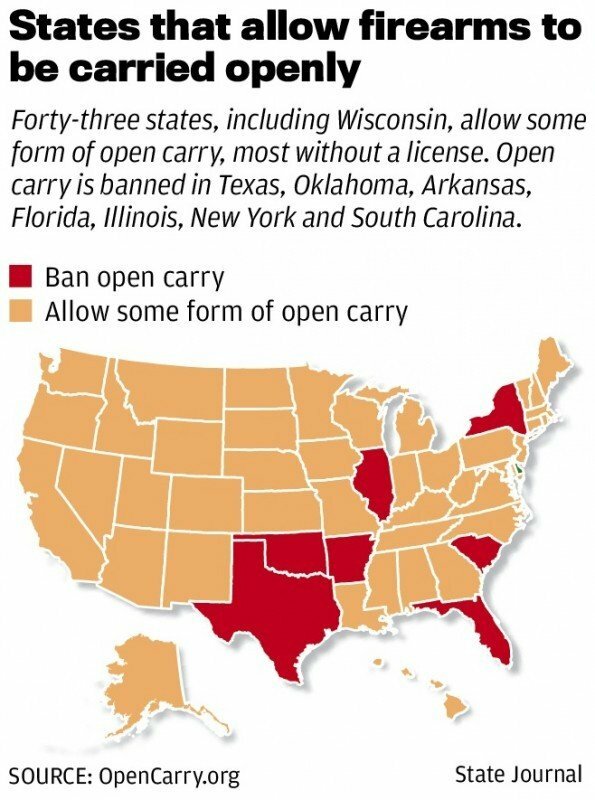 But Auric Gold, secretary of Wisconsin Carry, and Mike Stollenwerk, cofounder of OpenCarry.org, said police do not have the right to demand that people identify themselves without probable cause to believe they've committed or are about to commit a crime. That was not the case with the five Wisconsin Carry members who had simply gotten together to meet and have a meal, Winrich said. Winrich said he began carrying a gun about four months ago for personal safety and routinely takes it anywhere it is lawfully permitted without incident. "People know it is legal and it's not something to be concerned about," he said. "Most people really don't have much of a problem with it. They're just kind of curious." But Winrich, who made an audio recording of the encounter with Madison police, said he carries a recorder in case a problem arises. He said he chose not to give his ID to Madison police because of "the attitude and the overstepping of authority that they had." Wisconsin Carry won a $10,000 judgement against the city of Racine and its police department after Hannan-Rock was involved in a similar incident there, Gold said. 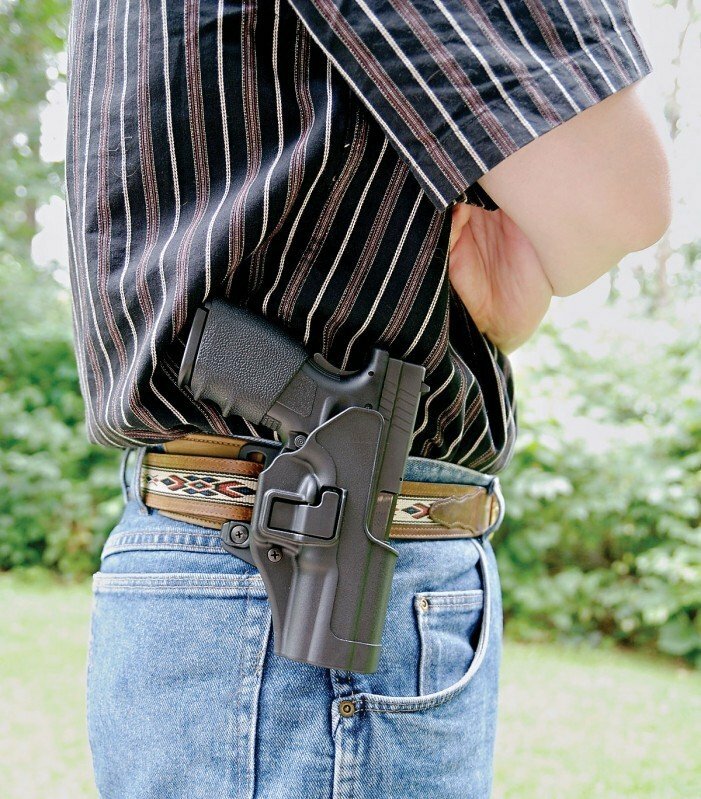 Openly carrying a firearm is "just like anybody else carrying a carrot down the street, or a cell phone," Stollenwerk said, adding that police in the 43 states that allow some form of open carry have become accustomed to people's right to have a firearm. "This stuff doesn't happen in the rest of the country anymore." Madison Police North District Capt. Cameron McLay said he believes officers acted appropriately in responding to a report of armed men in a public place in an urban setting, and the caller's concern that something might happen. McLay said police were going into "a highly ambiguous situation" and had to determine if a crime had been or was about to be committed and preserve public safety, while assuring the rights of all involved. "This is what the officers did in this case to the best of their ability." But McLay questioned whether obstruction was the correct citation given the circumstances. On Monday, detectives were sent to Culver's for further investigation to determine if another criminal charge, such as disorderly conduct, is warranted, McLay said. Based on initial police reports, he acknowledged, "There is no indication that a disturbance had taken place." McLay declined to comment on the legality of searching and detaining Winrich and Hannan-Rock until the police investigation is completed. Five men questioned by Madison police for having holstered handguns in a restaurant on Saturday night have been cited for disorderly conduct, because the complainant felt violence was possible. Madison police said Wednesday they will rescind obstructing citations wrongly issued to two of five men who were openly carrying firearms while eating at a Culver's restaurant, and instead cite all five men for disorderly conduct. The confrontation between five armed men and police last week has prompted businesses to consider handgun policies, made some residents uneasy and highlighted the issue again for lawmakers, who could address the similarly volatile concealed-carry issue next spring. Five men who wore holstered firearms at a Madison restaurant last fall filed suit in federal court Tuesday, alleging police violated their constitutional right against unlawful searches and seizure.